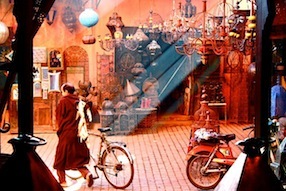 Marrakech’s hippest shopping destination is rue Mouassine in the Marrakech Medina. Bab Laksour and the Marrakech medina’s Mouassine district is an intimate introduction for first time visitors to Marrakech. The Mouassine in the Marrakech medina boasts many trendy, fashionable boutiques, antiques dealers along with arts and crafts shops. The Mouassine has become one of the best places to shop in Marrakech. One of the easiest ways to get to Bab Laksour and the Mouassine is from Avenue Mohammed V just after the Ensemble de Artisans which leads to rue Laksour. This route offers an alternative to entering via the Jemma El Fna and the crowded souks. 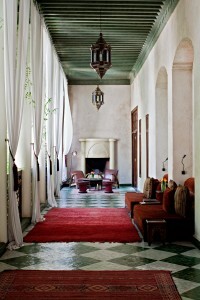 The Mouassine District is also home to Vanessa Branson’s stylish Riad el Fenn, located at the Derb Abdallah ben Hssain. 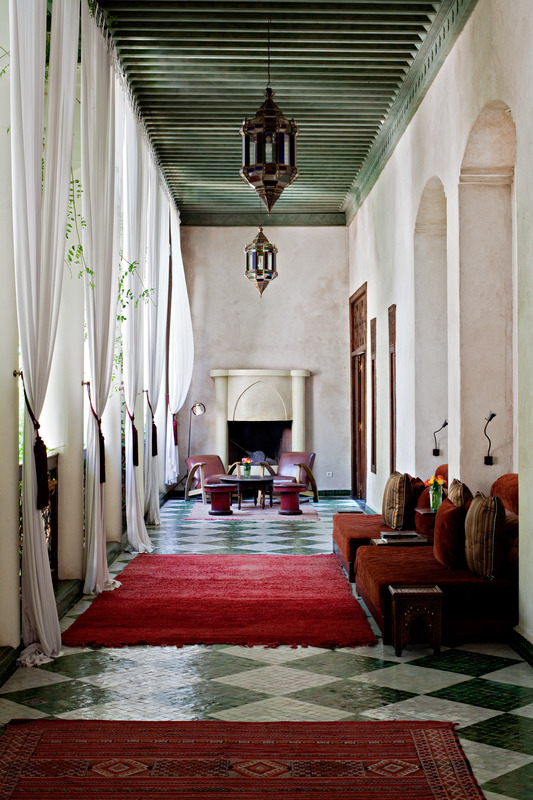 Riad El Fenn (fenn means art in arabic) is a former palace with panoramic views of the medina and Atlas mountains from its terrace. Also close by is the classical Moroccan restaurant, Le Tobsil. The Kounouz jewelry shop is also a well known place to shop and Maison d’ Argan for those who cannot make it to Essaouira. There are many spice and essential oils and natural product stores in the Mouassine. There are also many hanouts, Moroccan owned domestic shops,carpenters and a motorcycle repair shop. Normal domestic life blends seamlessly with the tourist scene in the Mouassine. Just footsteps from rue Sidi Yamani are antique shops, the Mouassine mosque and fountain. Kulchi, a stylish clothing boutique and Chez Khayati known for quality leather poufs and babouches are two well known boutiques. Kifkif is another intimate and trendy boutique that has jewelry, textiles, leather goods and accessories made by local artisans with a European twist. 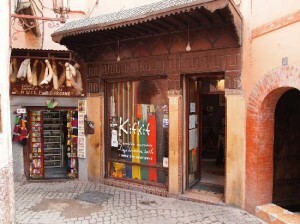 Kifkif’s owners have a boutique in both the Moussaine District of the Marrakech medina and in Sidi Ghanem, an industrial artistic district 15 minutes outside of the city center of Marrakech. Rue Laksour, the main street of the Mouassine has a candle shop that sells colored scented candles. There is also a store with traditional Berber musical instruments nearby Stylia Restaurant which is a former palace with a huge ornate door offering the very best in traditional Moroccan cuisine. The emporium, Artisanal Dar Essalam is also worth visiting. You cannot miss it with its over sized wooden doors decorated with a white stucco portal. The Artisanal sells all kinds of craft items and paintings, a veritable Aladdin’s cave at fixed prices for those who don’t want to haggle with shop keepers over tea. As you walk on the narrow streets of the Mouassine, a small wood shop displays its wares, bowls, boxes and trays. A covered section has another emporium, the Palais Vizier, which sells carpets. Mosques, local hanouts and riads line the streets of the Moussaine which offers the feel of ordinary life in the medina. Well known in the Mouassine for socially responsible shoppers is a women’s cooperative called Al Nour that sells hand embroidered sells scarfs, children’s garments and fine linen accessories, all made by handicapped women. Berber carpets line the wall of the Mouassine. Facing A Nour is an archway topped by a building of Portuguese origin which bridges the street. There is a spice and natural products shop. Passing through the archway you will find the large wooden door of the Kssour Agafay which is a 16th century riad once home to a noble chorfa family. It has been completely restored to its former glory featuring painted intricate stucco decoration and 4 meter high doors and carved wooden ceilings, by Abel Damoussi. As well as being a guest house it is also an exclusive private members club. If you knock on the door you might be lucky enough to be shown round. Nearby Kssour Agafay are two fine Berber jewelry shops and a ceramic store. Finally a kelim and rug shop with antique wooden doors on display, the Bazaar Chichoua, completes the rue Ksour and leads on to the rue Mouassine. If books are what you fancy then off route of the rue Mouassine is a French language bookshop filled to the brim of coffee table books on Morocco. To the right is the busy covered street leading to the Place Bab Fteuh and beyond it the entrance to the Souk Semarine. To the left the rue Mouassine leads on up to the Mouassine Mosque and its Fountain. During a walk through this gateway of the Marrakech souk you will also discover an impressive, colorful array of shops lining the street that offer the best in Moroccan handicrafts including jewelry shops, ceramics, leather goods, lanterns ,carpets, rugs, clothes, lighting design shops and fine linen (Kis boutique and Esprit Coton) spices and natural products such as Argan. Marrakech’s Mouassine District is full of surprises.